Sunun is a popular rhythm played at all popular festivities. Sunun is the song and the real name for the rhythm is Gui. This song is named after a female dancer, Sunun. Although there are many different songs for Sunun, a lot of them are about wedding and marriage. Now Sunun is a rhythm often played all over West Africa and no wonder there are many interpretations and variations. 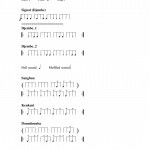 Although patterns for the dununs can be found for different bass drums, the melody of these bass drums together characterize the Sunun melody.